Hello! How are you guys doing? I’m slowly shaking off my post-holiday blues and getting on with things as this is going to be a busy week for us. We are finally getting our house keys this Friday!! Whoop whoop. We are beyond excited! We’ve already ordered a bed and we’re now shopping for a cooker as it’s still too cold for smoothie recipes, I think 😛 . It’s taken so long to get here that we are really ecstatic to finally be able to settle down somewhere and, although we both feel that our curiosity for what it’s like to live elsewhere will probably rear its head again at some point, we are planning to enjoy having some permanence in our life for a while. Recipe-wise, I swore that this week will be pasta-free as that’s almost all we ate throughout our holidays in La Palma. There wasn’t much quality vegan food available so we quickly decided to ditch going out for food (unless we found an unmissable opportunity) and cater for ourselves. It was simply easier and less wasteful to just buy one type of ingredient and have similar dinners throughout the week. We both love pasta so we were okay with that, but now that I am home, I’ve decided to give pasta a bit of a wide berth for a while. Today, I bring you a dish I’ve been meaning to share for a while. 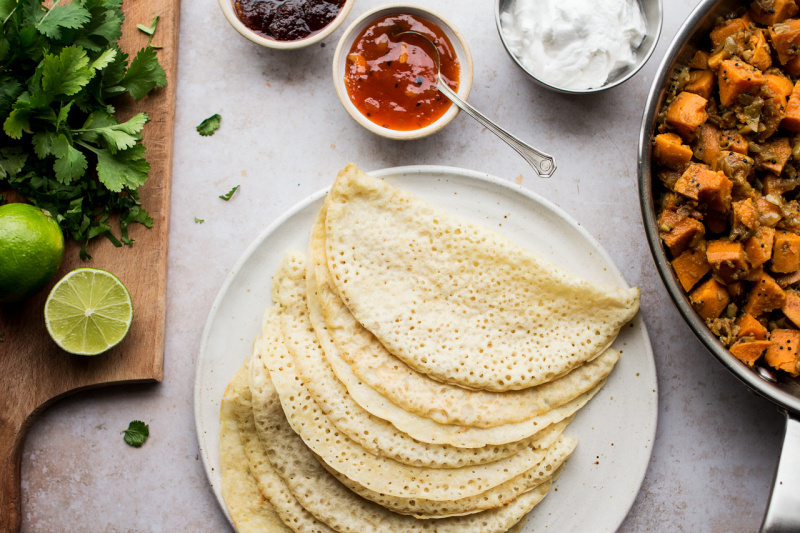 It’s my take on masala dosa with a twist. As opposed to traditional dosa, the batter for this one doesn’t require any soaking, blending or fermenting. 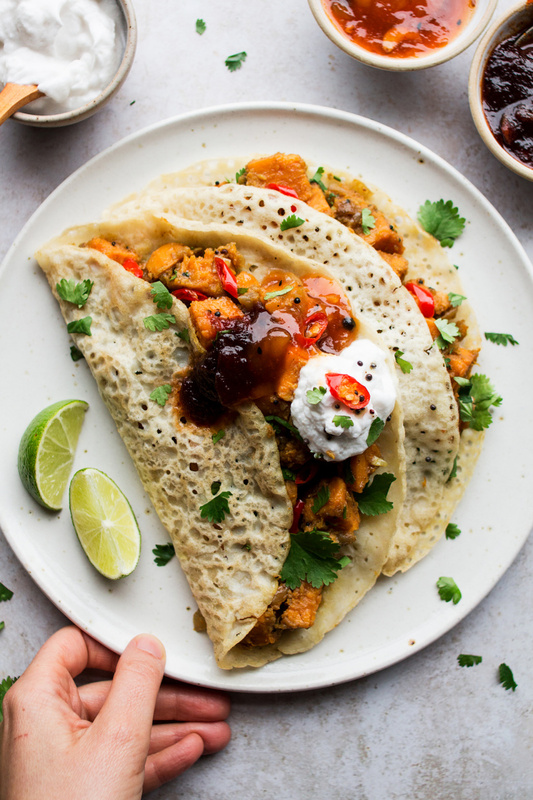 It’s a simple rice flour batter than produces super thin and crispy crepes, which beg to be filled with an aromatic sweet potato (not traditional, I know) curry. While you are welcome to make your own coconut and coriander chutney to go with these, I often serve it with shop-bought vegan coconut yoghurt and chutney and heaps of coriander. 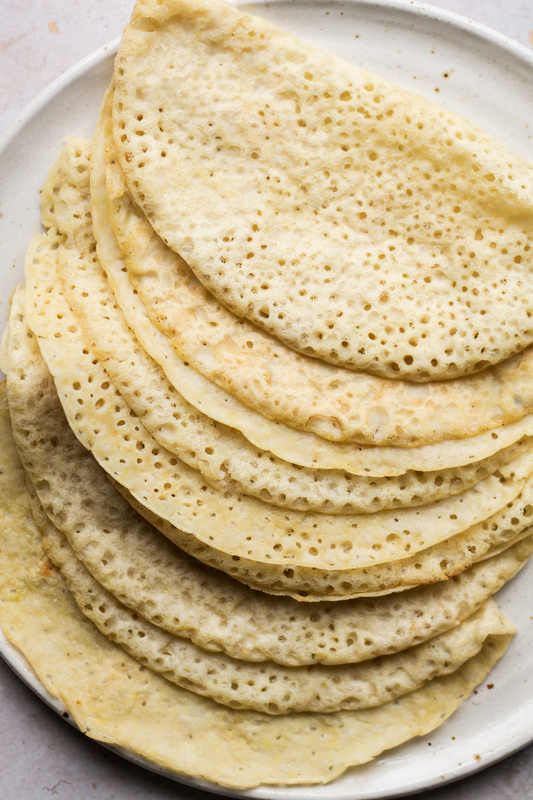 While these dosa-like crepes aren’t authentic, their advantage is that they are fuss free and fairly quick to make. They are also healthy, naturally gluten-free and filling. PS: If you make my sweet potato dosa, don’t forget to tag me on Instagram as @lazycatkitchen and use the #lazycatkitchen hashtag. I love seeing your takes on my recipes! Add chopped onion and chillies. Fry (stirring now and then) for a few minutes, until softened and lightly caramelised. Add in garlic and ginger and fry off gently until they both become fragrant and the garlic softens. Stir in garam masala and fry off for 1 minute stirring the whole time. Add cubed sweet potatoes and about 1 cup of water. Cover with a lid and cook for about 15 minutes – until the potatoes are cooked through. Turn off the heat but do not take the lid off just yet – allow potatoes to finish cooking in their own steam for an extra 5 minutes. Squash the potatoes with a fork / wooden spoon. Sprinkle with lime juice to taste and adjust the amount of salt to taste. Place rice flour, cornflour / cornstarch, salt and turmeric (if using) in a medium mixing bowl. Mix in approximately 2 cups of water to begin with and oil. Set aside for 10 minutes. Give the batter a good mix and check for consistency. It should be runny so you may need to add an extra splash of water to it to achieve this. Heat up a small non-stick pan (mine was 20 cm / 8″ in diameter) on a medium heat. Allow it to get hot before brushing its surface with ½ tsp of oil. Allow the oil to heat up. Mix the batter really well before pouring each crepe as rice flour tends to sink to the bottom really quickly. Ladle (do not pour and swivel like you would with regular crepes!) approximately 60 ml / ¼ cup (if using a 20 cm / 8″ size pan) of batter onto the pan in a circular motion, going from the outside of the pan to the middle. If any gaps form, quickly fill them with a little more batter, but be careful not to make the pancakes too thick by ladling too much extra batter on top of the set batter. There should be lots of little holes forming on the surface as soon as the batter hits the hot pan. If they don’t form it means that your pan / oil isn’t hot enough! Allow the pancake to cook on one side without touching it until the edges become golden and start lifting up gently (approx. 2-3 minutes). Turn the pancake gently using a large spatula and cook on the other side for 1-2 more minutes. The longer you cook them the crispier they’ll become, but they will lose their flexibility. I don’t mind that, but please adjust the cooking time to YOUR preference. Also be aware of your pan’s hot spots – once you flip your pancake, make sure you adjust its position on the other side to ensure that there are no raw batter areas. 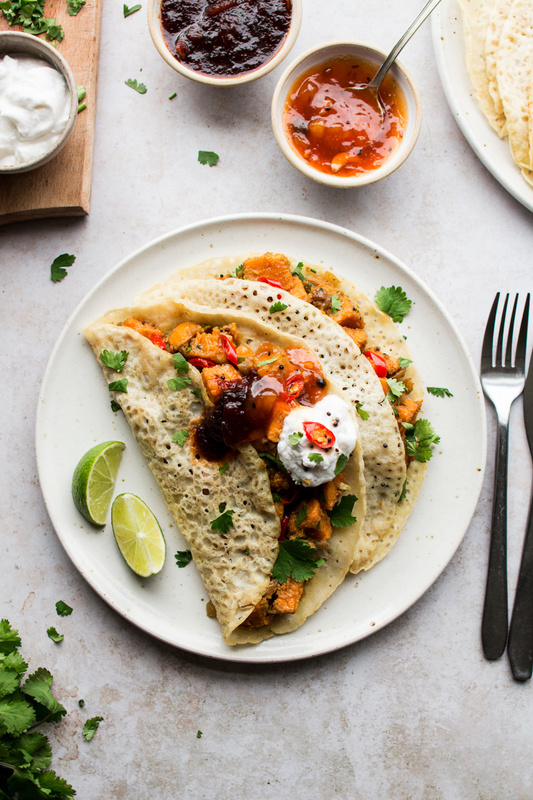 Fill each crepe with sweet potato filling and sprinkle with a generous amount of coriander. Serve with coconut yoghurt and a dollop of sour chutney on the side.